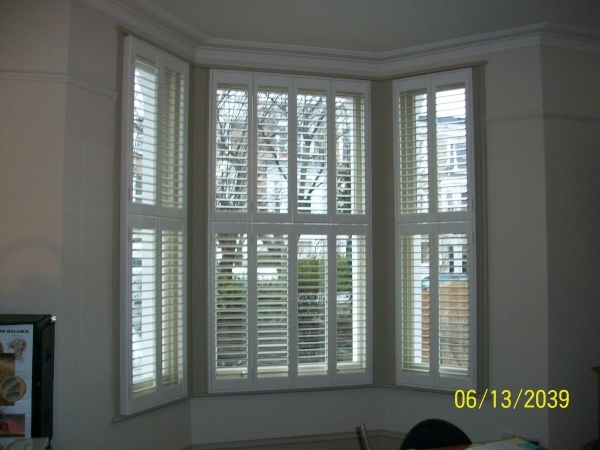 Domestic Shutters fitted in Victorian London home. We all know how much first impressions count, and that the presentation of your property’s exterior is often last on the list of to dos when designing your home. We think styling your home with Victorian window shutters is a sure fire way to create that wow factor with traditional domestic shutter charm! These Raynes Park, West Wimbledon shutters are a perfect example of how domestic window shutters can create ‘curb appeal‘. Choosing classic off white domestic shutters to compliment their detailed white window frames, with traditional slat push rods to match the Victorian properties SW20 street. The owners of these West Wimbledon shutters wanted a warm family home with domestic comfort at the heart and spent time choosing the specifics of their plantation shutter installation to maximise this. When arranging your shutter installation, proper consideration of how the outside of your property will look as a whole, will ensure you are happy with the finish. Unity of the front of the property can be created by having wooden shutters installed on both floors, balancing the property in domestic shutter bliss. These interior shutters in Raynes Park, South West London are a perfect example of this, with the shutter installation on both floors smartly tying in the whole of the property with the domestic window shutters clean, crisp lines, rather than the potentially muddled look of heavy, fabric curtains. Our Raynes Park wooden shutters customer was recommended to Shutterly fabulous by their friends who already had bay window shutters in their Brixton home.